To check availability or to book please contact Katherine on 0844 656 0522 or Trevor on 07738311741 and also e-mail mailto: holiday@blanches.co.uk Blanches Meadow is set in a private sheltered position above the breathtaking South Cornwall coast in 2.5 acres of gardens and lawns with panoramic sea and country views. You can walk down a beautiful valley to the South-West coastal path and its spectacular beaches, explore the delightful hamlet of Lansallos, take the ferry to the vibrant town of Fowey for restaurants and sailing or stroll around the old fishing village of Polperro just two miles away. Blanches Meadow sleeps five. 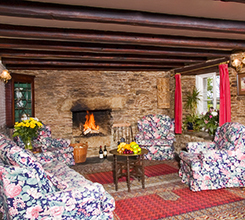 It is the original character cottage adjoining Windsor and has a piano and large log fire. There is free wireless broadband. For large gatherings you can accommodate nine next door in Windsor, the family house. Bring the dogs for some great walking. Blanches Meadow is the old cottage, which adjoins Blanches Windsor, and enjoys the same magnificent coastal position and beautiful views down to the sea. From the garden, you walk down through meadows of wild flowers to an almost private coves. Downstairs, there is a 24' drawing room with a piano, a large log fire and a traditional cloam (bread) oven. The floor is laid with slate, the stone walls pointed with cob mix and the ceilings are low and beamed. There are three bedrooms. Click Cottage Information tab for detail. We have PLENTY OF AVAILABILITY for holiday rentals from now onwards Both houses together could be reunited as one specatular property. Alternatively Meadow separated forms a lovely granny annex or self catering holiday cottage. To check availability or to book please call Katherine on 0844 656 0522 or email info@simplytime.co.uk We welcome owners with their pets. 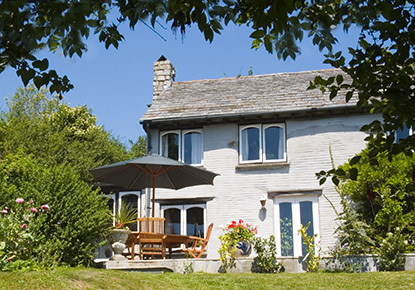 OLD COPY Cornwall - Lansallos - 2 miles along coast West of Polperro - Self catering holiday Cottage - 3 acres of gardens Out of season, the rental is for 2 people, with an additional charge for extra guests. Lansallos, Lantivit and Lantic Bay are just West of Blanches Meadow. Wonderful walking along the NTcoastal footpath. The fully equipped kitchen is has lots of nooks and cranies.